Arts and Crafts bar cabinet pictured in a custom two tone finish. Custom finishes on home bar cabinets need to be ordered by phone. Take a look at our arts and crafts wine cabinet. The arts and crafts wine cabinet is pictured in a custom two tone finish. Custom finishes need to be ordered by phone. Pictured in brown maple with CF-7992 Asbury Brown stain. Contact us for additional hardware options for this piece. See drop down boxes (shown top right) to select your order preferences. Pictured in oak with Kona stain. The Ensenada Wine Cabinet is Amish-made with a Shaker style. The cabinet's features include subtle shaping of the legs and back, giving the cabinet a classic, modern feel. Raised panel doors add luxury while sunrise drawer pulls give modern sophistication. The glass door shows off your wine. What better way to enjoy a glass of vintage than with an heirloom wine cabinet! The Ensenada is solid wood and ages as well as the contents within. Pictured in pine in Sage with Light Asbury finish. The country is a place to enjoy yourselves, so why not have a bar that matches the rest of your rustic home or cottage? This bar has a 15-bottle wine rack and plenty of open cupboards for storage. The wide top lets you entertain more guests, while the log accents and foot bar make a statement. Harken back to the wild west with this timber and log bar. The obvious wood grain, log foot rest, and half log accents belie a sensible, sturdy design. On your side, three open shelves are just as beautiful as the rest of the bar. This rustic bar will make your guests feel like they are in a saloon. With half log supports and rustic pine surfaces, this wine rack is a beautiful place for your fine wines. Enjoy this simply beautiful bar. With large surfaces of rustic, knotty pine, it adds beauty to rooms in a variety of styles. The foot rail is supported by metal hardware and the whole bar is built to last. This bar has all the features you need to entertain however you like. Convenient glass and wine racks are built in, while there is still plenty of space for more accouterments. This is heirloom furniture that future generations will love. Celebrate your beautiful cabin with this rustic wine cabinet. Made with Amish skill, this mortise and tenon wine cabinet will be lasting enough for your oldest bottles. Pictured in brown maple with CF-7992 Chianti stain. 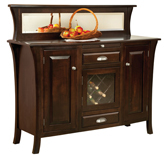 This buffet features double doors with beveled glass and optional wine rack or wood shelf behind the center doors. Bevel edge drawers, beaded door frames and applied molding on side and inside cabinet frame are the little details that make this buffet special. Also available with water glass in doors. Pictured in quartersawn white oak with Michaels Cherry stain. Also Availble with Wine Chiller instead of Lattice Rack. The Montana Bar with Foot Rail makes use of the Montana line's use of logs by providing a log foot rail as well as corners. Plain surfaces showcase this rustic piece's grain and knots. 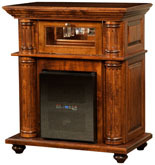 The Montana Deluxe Bar with Foot Rail has all the storage you need including wine glass racks in the top shelf. This rustic style bar shows off its natural woodgrain as well as having log accents. Copyright © 2014 Amishfurniturefactory.com. All Rights Reserved.